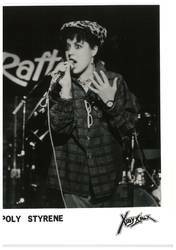 Poly Styrene, who passed away in 2011, will be the subject of a new book and exhibit in Paris. The book, titled Dayglo: The Poly Styrene Story, releases on March 28 via Omnibus Press. It was written by Styrene's daughter, singer-songwriter Celeste Bell, and author Zoë Howe (Typical Girls? The Story Of The Slits, Stevie Nicks: Visions, Dreams and Rumours). Last year marked the 40th anniversary of X-Ray Spex's Germfree Adolescents album. A film titled Poly Styrene: I Am A Cliché is slated for release in 2020, and an exhibition titled Paris-London Music Collection 1962 -1989 also celebrates her work, which opens on March 12, 2019 at the Palais de la Portee, Paris.